KELC has a new app for your phone! This is another great way to stay connected with KELC. 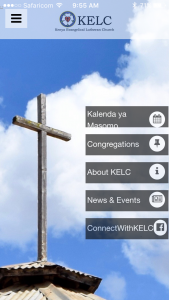 Our app has KELC calendar info, news updates, congregation locations, and lots of other useful information. You can find our app in the Play Store for Android or the App Store for iPhone. Download our app today! This is the app home page. 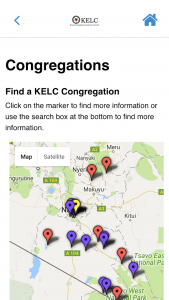 From here you can click on any of the links to learn more about KELC. Or click on the 3 lines in the top left corner to go to KELC’s website. 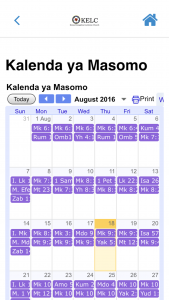 The Kalenda ya Masomo contains daily Bible readings. Click on the reading and a pop-up box will appear. Click on the Bible Link in the box and you will be re-directed to an online Bible with the selected reading. This map shows the locations of all of KELC’s parish and mission areas. Click on a marker and information about that location will appear. 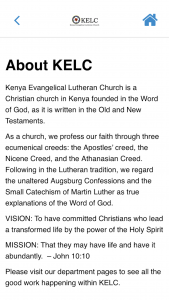 Learn more about the beliefs and mission of KELC.